Title: Legal Office Procedures, 7th Edition, 2017. With a Foreword by Gordon A. Ullman, of the Ontario Bar. Classification: Textbook for law clerks, paralegals, legal assistants; law office reference manual. Tina Kamakaris combines her extensive experience as a college professor with her legal office knowledge to create this high-quality Legal Office Procedures text that is respected throughout professional and educational communities. With Jane Kamakaris and Louis Kamakaris being graduates from law clerk and legal office programs and enjoying successful careers in the legal field, the text provides a firsthand eyewitness account of the legal office environment and the skills and professionalism that legal students require for a successful legal career. The text takes students step-by-step through start-to-finish legal files and also outlines the rationale, background, and substantive law behind these procedures, giving students a true glimpse inside a busy and dynamic legal office environment. Designed for Canadian college-level law clerk, paralegal, and legal office programs, the text uses a writing style that is concise, easy to follow, and ideal for students new to the subject. 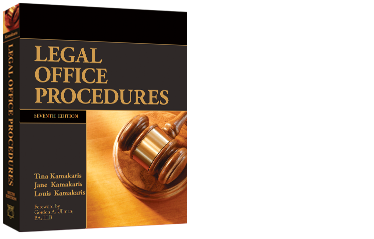 By incorporating the most widely practised areas of law into a single volume, this highly respected text covers the entire legal curriculum and also serves as a handy legal reference manual, carrying students from their legal classroom, to their legal field placement, to their legal workplace. Students can also purchase the Legal Office Procedures Workbook that includes hands-on start-to-finish legal files and assignments, including interfacing files and legal templates, aligned with each chapter in the main text. Start-to-finish legal files with ongoing full life cycle scenarios, to Aristotle’s, “The whole is greater than the sum of its parts.” Like a big puzzle that is difficult to put all the pieces together without seeing the overall big picture on the front cover, the start-to-finish files of Legal Office Procedures allow students to see the big picture and to understand the relevance and significance of each procedural part. This holistic method of learning eliminates mechanical performance and provides a good level of independence in the legal workplace by enabling students to anticipate and act with initiative on the next procedural step. Concise, comprehensive coverage of the most commonly practised areas of law — practice management, civil litigation, criminal litigation, family, corporate and commercial, real estate, and estates — all under a single cover, as opposed to seven individually priced books. Legal Office Procedures affordably covers the entire legal curriculum and renders its students at once employable in any and all of these areas of practice. Step-by-step practice and procedure aptly reinforced by substantive law, case law, and completed precedents. Principles of legal writing and oral presentation with exclusive examples by Manitoba’s Justice John A. Scollin and Ontario’s Justice Thomas G. Zuber. Legal tips to help students reveal important points in practice and procedure, including charts, tables, and screen prints. Chapter summaries and end-of-chapter review questions. Precedents completed on legal software: PCLaw, ACL, DIVORCEmate, Do Process (Conveyancer, Fast Company, Estate-A-Base).